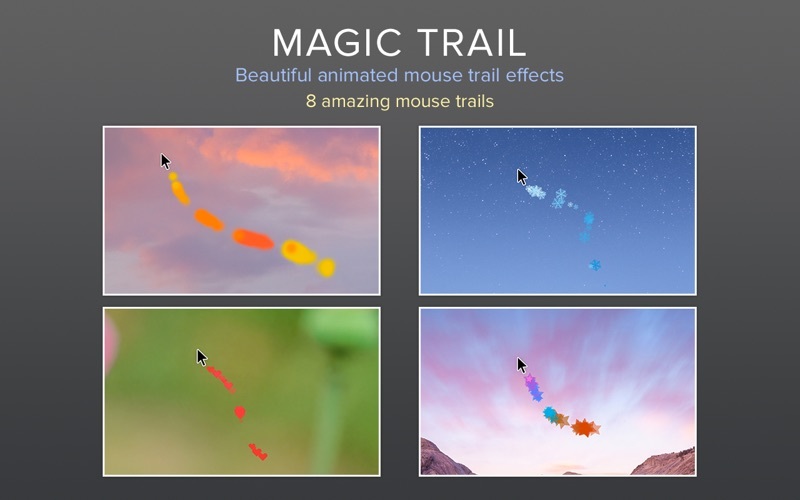 Magic Trail is a fun app that allows you to add special trailing effects to your mouse & trackpad pointer. It is the best app of its kind and even works with multiple monitors. Use it to impress your friends and brighten up your day with fun and interesting mouse effects! The app lives in your top menubar and from there you can easily access further options to customize the mouse trail. The length of each of these trails can be customised via the preferences. We've worked hard to make Magic Trail fun and pleasurable to use. We would love to hear your thoughts via email and make any improvements to future versions of this app. We intend to have an active development cycle powered by your feedback and support! !